For a start, it is a common mistake to assume a smaller tank such as a 10 gallon aquarium is easier to maintain than a bigger tank. In fact, maintaining a smaller tank is much harder due to the need to do more frequent water change. But if you do decide to start a 10 gallon aquarium, then you should know the best fish for your small tank. You should know what does a 10-gallon tank represent in the fish-keeping world? 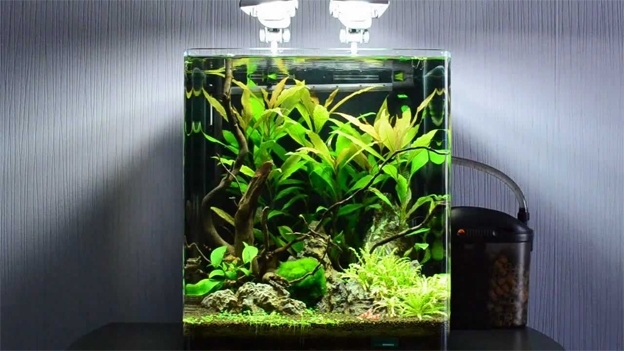 It is among the smallest and therefore not recommended to beginner aquarists, mainly because it is more difficult to maintain in terms of proper filtration, water change, and generally keeping everything in good shape. One of the reason a 10 gallon aquarium is not recommended to beginner is they often make big mistakes when deciding what fish to stock into such a confining aquarium, especially if considering a mixed species community. Thus, if you are a beginner, the first thing to do is stop being a beginner and do some research on your favorite fish. It is quite an easy thing to do nowadays with the global Internet. Only then should you go to the store, confident of your knowledge and decisions. What you should pay attention to? That said, you can’t keep two species comfortable with significantly different water conditions or a highly peaceful fish with an aggressive or territorial one (goes for any size of the aquarium). And, of course, you can’t stock fish that are simply too large for a ten-gallon aquarium such as Angelfish, Gourami, African Cichlid, or Bela Shark. Nevertheless, volume of the tank is not all that matters; there are dimensions of the aquarium that should also be considered. For example, the famous “inch per gallon rule” suggests stocking one inch of the adult fish per one-gallon of water. That sounds like nice and simple solution, but needs to be accepted with great care. For example, you may go to your friend’s and find his school of black skirt tetras very amusing making you want to set-up your own school, but you have a ten-gallon tank. 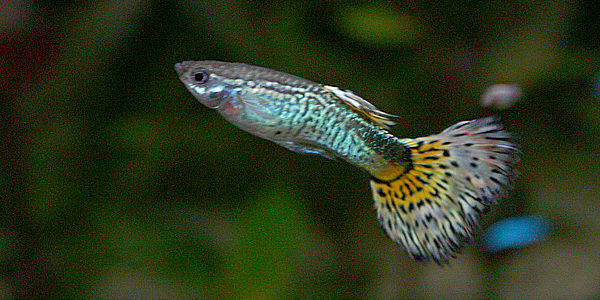 Since adult black skirt tetras reaches two inches in length at most, the inch per gallon rule would suggest putting five black skirt tetras in your aquarium; however, a thorough research of the fish explains they need at least six of their own kind in the tank and, since they are very good swimmers, nothing less than 24 inches long. Hence, it is obvious they have no business in your ten-gallon tank. Beginner hobbyists are also often tricked by the size of the fish in its younger stages and, as a result, stock cute little angelfish, that can reach 6 inches in length and 12 inches in height when fully grown, in a ten-gallon tank. A good start would definitely be stocking some Tetra fish, such as Cardinal tetra, Glowlight, or Neon tetra. As far as sizes and space requirement of these fish, they are ideal ten-gallon tank mates. They are all relatively inactive swimmers, so they don’t require much space and are small and peaceful fish. The only thing they don’t quite agree about is water temperature. While neon prefer 68° to 78°Fahrenheit, glowlight, and especially cardinals, like slightly warmer water (74° to 80°F). Yet this is not an obstacle since you can maintain the temperature at both sides, such as maintaining a temperature of 75° to 76°Fahrenheit. They are tolerant towards other species of fish, but can get nippy toward each other when stressed, so keep them in a larger school. Another fish you have to think about is the Dwarf Corydoras. 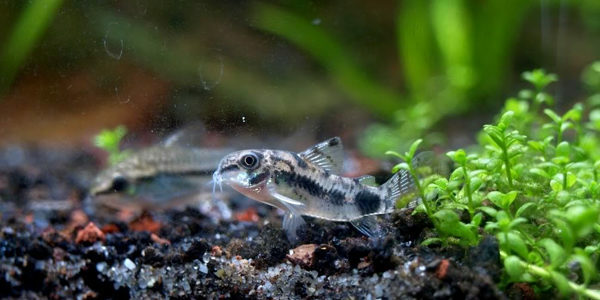 Dwarf Corydoras, or catfish, are interesting bottom-feeding species that get along with all peaceful tank mates, but should be kept in schools of six or more of its own. They are also very useful as tank bottom cleaners because they will pick up virtually everything that falls down to the bottom of the tank. Even so, you should occasionally provide them with some sinking pellets to be sure they get all the nutrients they need. The next option is the Sparkling Gourami, a small fish growing to 1.5 inches in length suitable for small densely planted tanks with lots of hiding places. Due to their colorful look, they can be a great addition for a creatively set aquarium. Although they can be quite shy sometimes, if kept away from aggressive fish they can be very sociable. 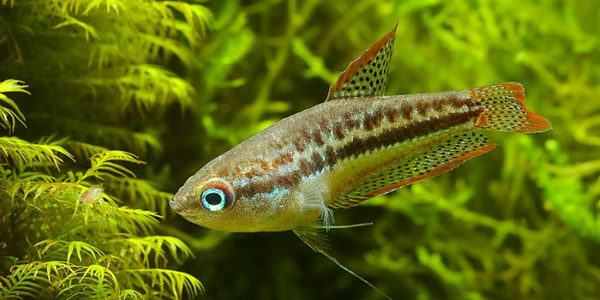 Another small vividly colored fish from the rank of livebearers that can be fun to watch in your aquarium is the Guppy. They come in a variety of different color alternatives, so there is much space for you to be creative when choosing from these fish. 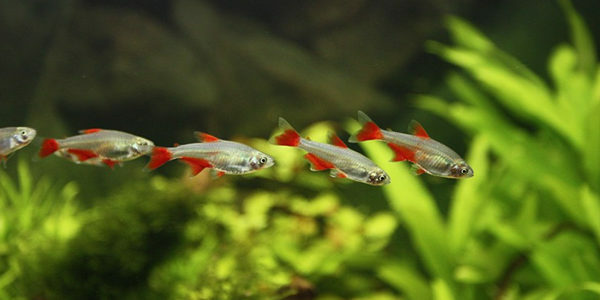 Unlike Neon Tetras and similar, guppies are very active swimmers in the top third of the aquarium, so that segment of the tank should not be heavily planted. 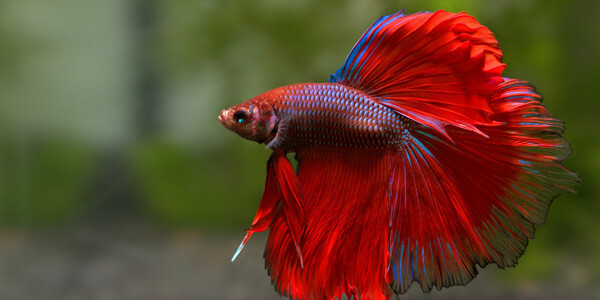 If kept with proper tank mates, the aggressive fish species known as the Siamese Fighting fish or Betta can do very well in your ten-gallon tank. However, this will only work if kept with peaceful species such as White Cloud Mountain Minnows, Corydoras, Ember Tetra, Harlequin Rasboras or the like, this brightly colored fish, with the most magical looking fins can be rather entertaining and a trouble-free option. Of course, there are lots of other species that can fit your 10 gallon tank such as Pencilfish, Least Killifish, different types of Rasboras, Dwarf Lamprologus, Kuhli Loaches, or even other species like Apple Snails, Nerite Snails, Ghost Shrimp, and Cherry Shrimp, which can add a live splash of color to your aquarium. Whichever fish or species you choose, do a thorough research on the fish or species you think is best for your tank. The main reason to research is because even if your fish can fit a gallon of such volume, it may not be compatible with some other fish/species you wish to add in terms of aquarium setup, water conditions, and behavior. Can goldfish go in a 10 gallon tank? That is a lie, i have had a goldfish in a ten gallon tank for years and it is still alive and healthy. It’s not a lie. Goldfish are pond fish and require bigger living standards. That’s common knowledge. I also have had a goldfish (single tail) in a 10 gallon for five years now !! It’s still happy and a little bigger but not a lot. I have 2 Goldfish in a 10-gallon aquarium. Everything is fine and both are healthy from last one year! Gold fish will grow to the conditions of their environment. They only grow as big as their tank will let yhem, but I would still only put two or three fish in a tank, thus you aviod putting stress on the fish. no they dont, thats very false, they’ll keep on growing no matter what they are in. Thats a lie. The outside of the goldfish body stops growing but thr organs keep growing until they die. Goldfish need at least a 20 gallon tank, so no. depends on the type of goldfish you get. If it’s a fancy tailed, no way. They grow to about 6 inches in size. If it’s a comet, you will have better luck but I wouldn’t recommend a 10 gallon for their whole life. Maybe just in their beginning years. can i put ten different tropical fish in a ten gallon. Not recommended. Many types of fish need to school (ie be in groups of minimum 6) to be comfortable. Try aquarium forums for stocking suggestions and don’t overstock. It’s less work for you and less chance of your fish dying. you can go for 6 neon tetra,6 cardinal tetra or glow light tetra and 2 shrimp to help u clean your tank. Lost me at the beginning i don’t think it is ok to down grade beginners just because. how about a bunch of shrimp in a 10 gallon? then a swimmer or two? guppies? Can I put an African dwarf frog in my ten gallon with my betta, two mystery snails, and three corydoras? No. The Betta will pick on the frog. He will also out compete in the food department, and the frog will likely starve. I have a betta in with my corydoras, largish Amani shrimp, Baby bristle nose pleco(may put him in my larger tank later on), and four African dwarf frogs in a 20 gallon long. They all get along fine the betta doesn’t go after the frogs. I feed a variety -frozen bloodworms, frozen brine shrimp, pellets, flakes, algae wafers…and everyone gets fed. A lot of the food types sink quickly so the frogs all gather and eat it. Also, I just introduced my corydoras and my betta will get near them and flare his gills but he won’t charge, is that still going to be a problem? No. I don’t think so. I have had a male betta with some cories, and my betta did the same. He never went any further than that. Goldfish can be kept in as little as a 5 gallon aquarium. I have done it and it was successful. It will only work temporarily, so after some time they will definitely need a new home in order to survive. If you were to decide on a 5 or 10 gallon make sure your filtration is eduacate and if it is not do more water changes. I had a filter that was ok and I was doing 1 to 2 water changes and gravel cleanings per week. It will get tiresome after a while. You cant keep a goldfish in a five gallon tank even if it is a baby. If it is a baby then a ten gallon temperary tank. I had 3 neon tetra’s in my tank and they died the next morning. How do you keep this from happening. I also have 3 guppies In my tank to. How did you introduce your fish to the tank? Did you float the bag and slowly add tank water to it? Did you test the tank water…there are many variables that could have killed your fish. Temps, nitrogen,ammonia. Always good to keep a test kit and know what is going on in your tank, even if the water is crystal clear. yes thats how you introduce fish. you must acclimitize them by putting the bag in the tank for 15 minutes, then pour a bit of tank water in there, then wait five minutes and THEN put them in the tank. You can’t put in new fish too soon. So, I have a 10 gal. tank and I would like to put a betta and 6+ cardinal tetras in there. Should I stock my tank differently or is this okay? 6 cardinals, one betta is absolute maximum. no more. I have a planted 10 gallon that I am thinking of adding fish to. Which combo would work best.